I loved Greek mythology since I was a child. Ancient Greek costume is interesting as well. 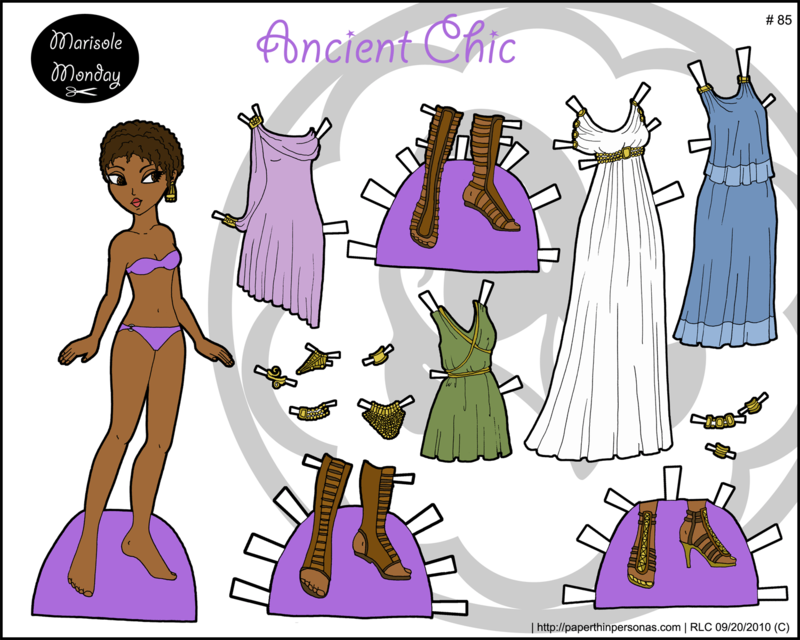 I should state as a very clear disclaimer that today’s paper doll has about as much in common with Ancient Greek costume as the average Chinese take out place has with actual Chinese food. However, there are some excellent Ancient Greek costume sources available on the web. The interest in all things Ancient in the Renaissance gave rise to a whole series of pottery and sculpture studies, many of which are available online for free since they fall before the 1923 US copyright cut off date. The Ancient Greek Costume Bibliography was my primary source. Though her start date of 1784 cuts out a lot of very early works, many of the sources are available online. I like Greek dress from 1908 and Rehberg’s Drawings faithfully copied from nature at Naples and with permission dedicated to the Right Honourable Sir William Hamilton which is a book with an insane title, but is a collection of reproductions of Roman and Greek statuary. So, those are a couple good sources to start with. I should say Rehberg’s has been reproduced a few times under different titles, so make what you will of that. Edit 4/6/2014: This set is now available here in black and white for coloring. Yay! cute!!! My link i guess! I have loved ancient Greek clothing since I watched Clash of the Titans when I was seven. ( A long time ago. :) ) A good resource for research is Costumes of the Greeks and Romans by Thomas Hope. His drawings are clear and graceful. I like all of your renderings for Marsole they are beautiful.